America is now producing the most crude oil in the WORLD! DAILY CALLER – The U.S. surpassed Saudi Arabia to become the world’s largest producer of crude oil, according to preliminary estimates from the U.S. Energy Information Administration (EIA). 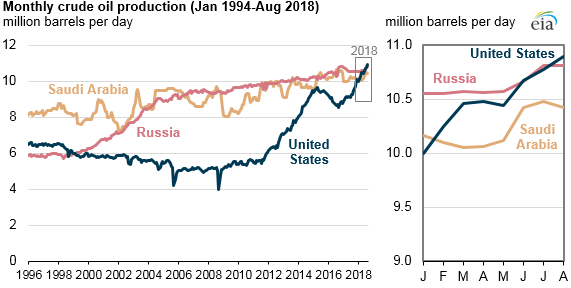 Indeed, U.S. drillers have continued to smash production records in 2018, including hitting 11 million barrels a day in output in July. That’s about double what the U.S. produced per day just eight years ago. News from EIA comes after the Interior Department announced record-breaking revenues raised from an oil and gas lease sale in New Mexico. The lease sale raised nearly $1 billion in bonus bids, according to the department. “Critics of the Administration’s American Energy Dominance policy often falsely claim there is little to no interest in Federal oil and gas leases,” Interior Secretary Ryan Zinke said in a statement. “Today they are eating their words and once again President Trump’s policies are bearing fruit for the American people,” Zinke said. This is really fantastic news. The oil boom that start in 2011 is really paying off. A lot of this oil is coming from Texas, by the way, who is slated to become the #3 oil producer in the world by next year according to reports earlier this year. The other areas responsible for this is western New Mexico, the Federal Offshore Gulf of Mexico, and the Bakken region in North Dakota and Montana. Hopefully at some point in the near future we can completely stop buying oil from Saudi Arabia and finally become energy independent, which has been a goal of the US for at least half a century.